The new membership year started with our AGM on 15 May 2017 and it is time for membership renewals or for those who would like to become FoSH members to become a Friend of Seafield House. Corporate memberships are also welcome. Details are to be found in the Membership section of our website. FoSH continue to monitor the building and will continue to update the local Seafield community by leaflet and personal contact and maintain our website, Facebook page and Twitter feed over the time that it takes for planning permission and consents for the restoration of Seafield House as residential apartments and the building of the small number of houses in the grounds as the enabling development. We would welcome your support in this hopeful year for Seafield House. Please become a Friend or renew your membership by completing the form in the Membership section of our website. The Mail Online recently published an article showing photographs of the decaying interiors of Seafield House. The images show the very sad state of the building with rotten ceilings and floors, with mould and damp and exposed brickwork. Unfortunately the article contains several inaccuracies and fails to mention Friends of Seafield House (FoSH), and the campaigning FoSH has done with SAVE Britiain’s Heritage to ensure that the house is not destroyed. FoSH continue to push for progress on development of Seafield House and hope that action will be taken soon before what remains of the architectural detail decays beyond restoration. FoSH would urge people not to attempt to enter the building. Not only is the structure very unsafe, but the creation of entry points into the buildings will encourage others to go inside who could cause further damage, either accidentally or on purpose. If you would like to do something to help Seafield House then support the work of FoSH and follow our news and events online. A fabulous night was had by all at Waterstones Ayr as we gathered on World Book Day to listen to Beatrice Colin read from her novel To Capture What We Cannot Keep. Beatrice enthralled us with an excerpt from the air balloon excursion over Paris where Cait Wallace first meets Emile Nouguier. To set the mood we were treated to french fizz, a delicious sparkling Blanc de Blanc, supplied by Corney & Barrow, Ayr. In recognition of the Seafield connection Beatrice also read an excerpt where Cait had returned to Glasgow and was meeting with William Arrol. Sparkling wine, air balloons and Parisian romance. Afterwards Beatrice gave us an insight into her research for the novel and how she so perfectly managed to capture the atmosphere and spirit of the period. The attitudes, clothes, city sites and engineering work are so well described that you are transported to late nineteenth century Paris and Glasgow at the time of the Eiffel Tower and Forth Bridge constructions. But all too soon the evening came to an end and Beatrice followed in Arrol’s footsteps, catching the train from Ayr back to Glasgow, albeit without steam engine or horse-drawn carriage to meet her at the other end. Last night saw the launch, in Glasgow, of Beatrice Colin’s latest novel To Capture What We Cannot Keep. It is a story of love in the 1880s set around the construction of the Eiffel Tower and may be the first work of fiction to feature Sir William Arrol. It follows the romance between Émile Nouguier, one of the engineers who designed the Eiffel Tower and Cait Wallace, a young widow and chaperone to Alice and James, a niece and nephew of Sir William Arrol. Whilst Cait and the Arrol siblings are purely fictional characters, Beatrice has cleverly woven them into a story based around historical fact. She was inspired to write the story following a visit to Paris which sparked her interest in the Eiffel Tower and she chose Émile Nouguier as a central character for the story. Beatrice also wanted to introduce a Scottish dimension to the story and it was only when she discovered that Gustave Eiffel had attended the opening of the Forth Bridge that the Arrol connection was made. As Beatrice has pointed out, both Nouguier and Arrol are responsible for building famous iconic structures, like the Eiffel Tower and the Forth Bridge, and yet, despite their achievements, the two engineers are relatively unknown. Beatrice Colin lives in Glasgow and is a novelist and lecturer in creative writing, and this is her 7th published book. It was during her research on Sir William Arrol that first introduced Beatrice to Friends of Seafield House, when she came along to the launch of the campaign, back in 2012. Since then we have been intrigued to hear how her story developed and eagerly anticipated its completion. To celebrate its publication, Friends of Seafield House have arranged with Waterstones bookshop in Ayr to host an evening event with Beatrice Colin on 2 March. Keep an eye on this page for further details if you would like to come along and hear Beatrice read some excerpts and talk about her novel. An Arrol descendent recently got in touch to tell us of her old family home, Glenarrol, in Victoria, Australia, which bears an amazing resemblance to Seafield House. As the photographs show, the layout of the hallway is almost identical to that of Seafield House and Glenarrol also features similar wooden panelling on the walls, ceilings and above the doorways. The dark, heavy architectural designs of this type were very popular in the late 19th century when Seafield House was built but surprisingly Glenarrol was built much later, in 1928.
Who would have thought that behind the door of the contemporary 20’s cottage-style, red-brick home lay an interior inspired by scottish victorian design? Vanessa Kiessling explained that the house was built by her grandfather, David Rodger, the youngest son of Jane Arrol Faulds. Jane was born in Johnstone, Renfrewshire in 1840, the year after Sir William Arrol was born and the area where he grew up before moving to Paisley. The exact family connection to Sir William Arrol is not known but the family always referred to him as “Uncle”. Jane’s husband, David Rodger, died at sea before his son David was born in 1873, leaving Jane to bring up their 5 children on her own. Early in 1885 her eldest son, Peter, emigrated to Australia and once he had settled in Melbourne, sent for his mother. Together with 11 year old David and his 2 sisters, she sailed on the Loch Tay later that year to join him. Peter set up a building business in Melbourne and was contractor for many well-known buildings including Flinders Street Railway Station, Melbourne, and St John’s Cathedral, Brisbane. His young brother David also became a builder and joined the business, working as foreman on many of the sites. David made several trips back to Scotland and in 1912 got married in Port Glasgow before returning to Melbourne with his bride. It is thought that during these trips he may have visited “Uncle William’s” Seafield House and was so inspired by the design that he used elements of it when building his own home in 1928. Many thanks to Vanessa Kiessling for sharing her amazing story and photographs, and for permission to use them on our website. Following the success of the Bascule Chambers performances last year, Iain Chambers is returning to the Totally Thames Festival this September with a new programme to be performed inside the Tower Bridge bascule chambers. All the steelwork for Tower Bridge was manufactured by William Arrol & Co. Ltd. in Glasgow and shipped down to London for construction. Bascules are the steel sections of the bridge which lift to allow passage of tall ships underneath. The bascule chambers are massive, brick-lined spaces which house the counterweights that enable the bascules to be raised. Performances of “Bascule Chambers” are being held on the weekend of the 24th and 25th September. 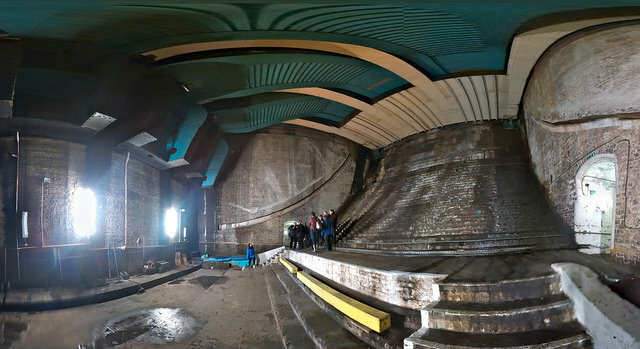 A unique opportunity to admire Arrol’s engineering prowess whilst listening to classic and contemporary music in the atmospheric subterranean chamber. Further information on the performances can be found on the Totally Thames website. Further information on bridge tours can be found on the Tower Bridge Exhibition website.